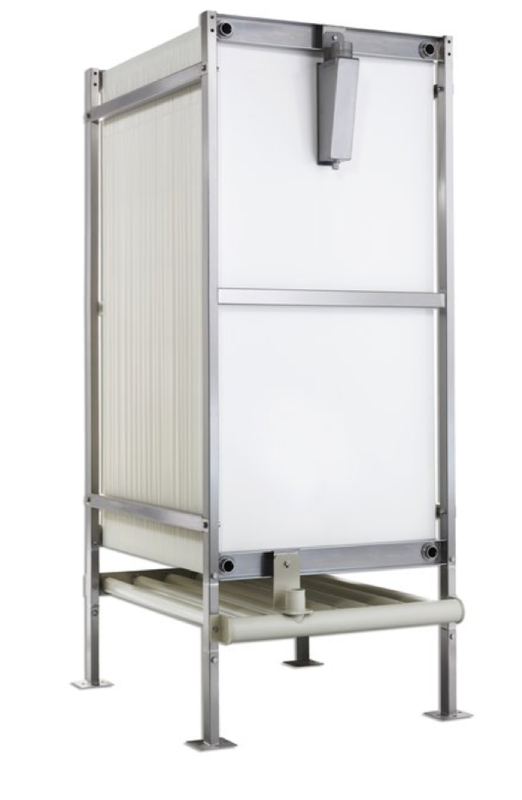 Membrane Bioreactor (MBR) is the combination of conventional biological treatment (activated sludge) with membrane filtration to provide an advanced level of organic and suspended solids removal. The membranes replace the sedimentation basin, the restrictive factor for sludge concentration. MBR systems can process significantly higher sludge concentrations (10 to 20 g/l) and with lower reactor volumes compared to conventional systems. Hollow Fibre technology refers to vertically orientated membrane bundles installed inside a frame with an integrated aerator. Flow is from outside to inside with some membrane slack allowed for lateral movement from the air bubbles. Permeate filtered water is collected from a collection chamber at the ends. HF membranes are used for immersed MBR’s for industrial and wastewater. Retrofit existing tank or new capacity upgrade expansion potential. Membrane surfaces cleaned by water flow and air bubble impact - Fibre bundle moves laterally due to air flow providing effective membrane surface cleaning. Chemical clean only design does not require backwash. In-situ CIP without draining membrane tank. Biological solids are retained in the bioreactor meaning that solids retention time (SRT) can be controlled independently from the hydraulic retention time (HRT). Long SRT promotes the development of the slower-growing micro-organisms, specifically nitrifiers. MBRs are especially effective at the biological removal of ammonia (‘nitrification’). The small pore size (<0.05 µm) of the membrane means that the treated effluent is of high enough quality to be discharged to sensitive receiving bodies or to be reclaimed for reuse. Can be fed directly to reverse osmosis process to substantially increase membrane life. Require 50% ​less space in ​comparison to ​CAS systems with no ​clarifiers or tertiary ​treatment and reduced HRT. ​Sludge beds are also smaller due to less biomass wasting. Reduced volume of aeration tank.